Delightful air conditioned villa, fully renovated, re-fitted and newly furnished in 2014, set in a complex with its own small garden and a private swimming pool. Located in the region of Pylos in the south-west of Peloponnese. Just 800 metres from the sandy beaches of Gialova and nearby local shop. Gialova 5km. 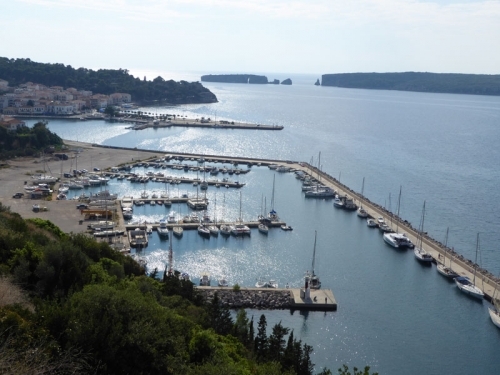 Pylos 5km and Athens 280km. Kalamata airport 50km. The accommodation comprises a large living and dining room with two sofa beds and a kitchenette. Double bedroom (1 x 140cm wide bed) with en-suite bathroom and toilet. Two twin bedrooms (2 x 90cm wide beds in each) with a shower room and toilet. Balcony with garden furniture. NOTE: we have five near-identical villas with the same specification, the photographs are of one of them, you can expect almost exactly the same.